There must have been something good in the air in 1999, judging by the number of golden glints I recorded during the year. (The old Panasonic Super-VHS camera does make the most of that sort of lighting.) It was a bumper harvest of locomotives, some of which, such as 31625, 45110 and 48773, I have not seen on the main line since. I didn’t need to travel very far, either. 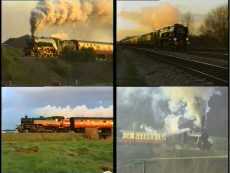 There are only a couple of shots from north of Birmingham or west of Bristol. 2nd Jan, The Midlander (Gloucester-Lickey-Tyseley-Kidderminster-Gloucester): Lickey Bank (Blackwell), Kidderminster. East Croydon-Redhill-Guildford-Alton): Gomshall, Chilworth, Bentley. 9th Jan, The Merchant Capitalist (Nuneaton-Kettering-Victoria): Wymington. 13th Mar, The Merchant Sailor (Didcot-Westbury-Salisbury-Southampton Docks-Basingstoke-Didcot): Upton Scudamore, Southampton Docks. 9th Oct, Charter (Stratford-Walsall-Stafford-Blackpool): Shrewley Common, Mill Meece. 23rd Jan, William Shakespeare Express (Paddington-High Wycombe-Stratford-Oxford-Paddington): Bradenham, Lower Heyford. 10th Mar, VSOE Special (Victoria-Swindon-Bath-Newbury-Victoria): Wooton Rivers. 27th Mar, William Shakespeare Express (Paddington-High Wycombe-Stratford-Oxford-Paddington): Bradenham, Claydon, Somerton, Kennington. 24th Apr, The Salisbury Spire Express (Victoria-Andover-Salisbury-Westbury-Reading-Victoria): Great Wishford, Pewsey, Wokingham. 2nd Oct, The Treacle Eater (Victoria-Andover-Yeovil-Southampton-Woking-Victoria): Andover, Milborne Port. 14th Feb, The Valentine Express (Paddington-Westbury-Salisbury-Basingstoke-Paddington): Aldermaston, Newbury. 13th Nov, The Wessex Royale (Stratford-Didcot-Basingstoke-Andover-Southampton-Weymouth): Thrupp, Kennington, Overton, Monxton, Dunbridge, Lyndhurst Rd, Sway. 18th Apr, The SLS Special (Birmingham-Stratford-Banbury-Didcot-Oxford-Worcester-Birmingham): Harbury, Kings Sutton, Stonesfield. 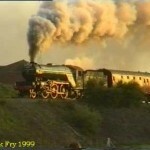 29th Aug, The Shakespeare Express (Birmingham-Shirley-Stratford and return): Bearley Junction, Danzy Green. 6th Mar, The Master Cutler (Sheffield-Derby-Marylebone): Harbury. 19th Apr, Test run (Ealing Broadway-Didcot & return): Cholsey, Didcot. 25th Apr, The Mayflower (Didcot-Newbury-Plymouth): Didcot, Crofton. 15th May, The Eastern Envoy (Par-Didcot): Cole, Westbury. 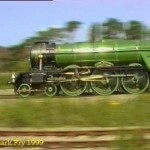 26th Jun, Test Run (Southall-Oxford-Birmingham-Worcester-Oxford-Southall): Culham, Budbrooke, Bentley Heath, Honeybourne, Radley. 25th Jul, The Sarum Scotsman (Paddington-Newbury-Salisbury): Aldermaston. 31st Oct, The Shakespeare Scotsman (Marylebone-High Wycombe-Stratford and return): Bradenham, Cropredy. 5th Dec, The Shakespeare Scotsman (Euston-Oxford-Stratford rtn): Northbrook. 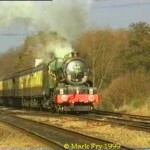 20th Mar, The Quantock Flyer (Alton-Reading-Newbury-Bishops Lydeard; Westbury-Newbury-Alton): Aldermaston, Great Bedwyn. 24th Apr, The Worcester Standard (Alton-Birmingham SH-Worcester-Alton): Upper Heyford, Budbrooke, Wokingham. 15th May, The Dorset Flyer (Alton-Weymouth and Yeovil-Frome-Alton): Winterborne Herringston, Yeovil Junction, Berkley Marsh. 2nd Oct, The South Western Standard (Alton-Reading-Newbury-Exeter-Salisbury-Alton): Mortimer, Andover, Burlescombe. 20th Nov, The Red Dragon (Alton-Cardiff and return): Callow Hill, Over. 20th Mar, Tytherington/Westerleigh Shuttles (Yate-Tytherington-Westerleigh-Yate): Westerleigh, Iron Acton, Tytherington. 21st Mar, Avonmouth Shuttles (Severn Beach-Bristol, Bristol-Avonmouth-Bristol, Bristol-Severn Beach): Sea Mills, Hallen, Clifton Down, Crook’s Marsh. 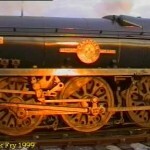 BR Standard Class 4MT 2-6-4T 80079 & 80098 (3:21). 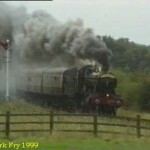 22nd May, The Inter-City Tanks (Finsbury Park-Kemble-Stourbridge Jct-Tyseley): Milton, Coates, Churchdown. 11th Dec, The Midlander (Nuneaton-Gloucester): Lickey Bank (Pike’s Pool).